If you’ve been following along on my instagram stories, you know that living inside a 120 sq ft. “hut” has it’s culinary challenges. Don’t get my wrong, I love the minimalist maui life, but sometimes a girl just wants to bake something, ya know? Well, don’t get too excited, since baking anything is completely off the table for now (#nooven). And I have to get pretty creative if I do want to make anything from scratch, other than throwing a bunch of ingredients in a bowl and calling it a meal. But I did it!!!! I crafted these incredibly simple-yet-delicious, all-you-need-is-a-blender-and-a-microwave, sour mango gelatin gummies. 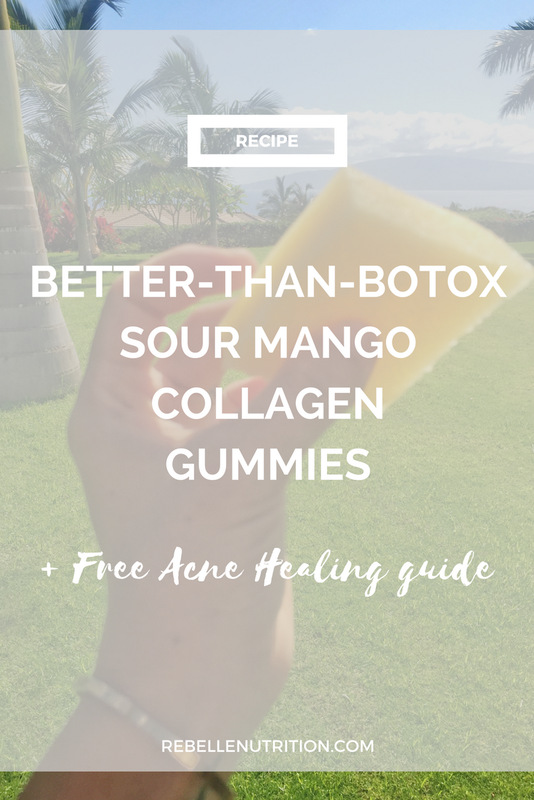 Not to mention, these sour mango gelatin gummies are chock full of vitamin C and pasture-raised, 100% grass fed gelatin; two of the most important nutrients to help rebuild and repair collagen production in our skin (hence the name, better than botox). PLUS - this version is free of added sugar (another culprit for skin related issues like acne, and collagen breakdown). As you are probably well aware, collagen production starts to decrease after the age of 25, which is why eating collagen-boosting foods containing things like gelatin and vitamin C are so important if we want to keep our skin looking youthful and acne-free. Grab my free e-book about healing acne naturally here! Bone broth is another great option for a collagen-building superfood, but if you’re like me and limited on kitchen appliances (and semi-lazy), this might not be an option for you. This is why I recommend vital proteins collagen peptides and use them on a daily basis myself, as part of my skin-healing, gut-healing and beautiful hair - growing regimen (ok so i'm a little vain). Learn more about the benefits of collagen protein here! Place water and mango chunks in a microwave safe dish, microwave until mango is thawed and water is hot but not boiling. Pour mixture into Vitamix or food processor. Add stevia. Blend until completely mixed. Add 4 scoops of vital proteins gelatin and re-blend on low until completely mixed in. Quickly pour mixture into a glass dish or baking mold. Refrigerate for 3 hours - enjoy! If you try this recipe, let me know on Instagram! Tag me @rebellenutrition and use the hashtag #betterthanbotoxgummies ! I'm super excited to be talking about one of my favorite topics today: healing acne through nutrition and natural skincare. I am going to start off with some actionable steps you can take if you are already eating a paleo/real food diet and still suffering from painful acne or other skin problems. Make sure to stay until the end when I talk about my favorite non-toxic skincare products for acne- free skin! Leaky gut is at the root cause of nearly every health symptom imaginable, and I find that repairing the gut lining is one of the quickest ways to improve a variety of skin related conditions – specifically acne. Some of my favorite gut-healing nutrients include L-glutamine, collagen peptides, plenty of nutrient rich bone broth, and DGL, and aloe vera. The unfortunate truth is, if you have hormonal acne and you continue to do intense workouts in the form of running, cross fit, cycling, or anything that elicits a stress response in the body – this is likely to be a key player in the formation of your acne. Intense exercise leads to heightened levels of stress in the body, causing increased cortisol output and insulin production. For women especially, this can also throw off the delicate balance of progesterone to estrogen – amplifying testosterone levels and causing increased oil production, clogged pores, and – acne. If levels of stomach acid or HCL are inadequate, not only can this cause digestive distress like acid reflux and bloating, but the kidneys and liver can become overburdened from the digestive stressed placed on them and respond by eliminating toxins via the bodies largest organ system: the skin. Make sure to chew your food well, eliminate food sensitivities, and support your stomach acid with things like apple cider vinegar, lemon juice, or betaine HCL for more powerful help. Get my free e-book on healing acne NATURALLY! I’m willing to bet that if you have acne, you’ve already tried nearly every product on the market, just like I did years ago. As a Nutritional Therapy Practitioner, I tried so hard to make the oil cleansing method work for me, but all it did was create a mess of my bathroom and make my skin look greasy. When I finally learned about Beautycounter, a company that aims to remove harmful toxins and chemicals from their skincare products (without compromising performance), I was sold. Now i’m a pretty much a Beautycounter whore; because their products are not only something I can feel good about using because of their non-toxic ingredient list (see their "never" list below), but because they still have that Sephora or BirchBox-quality feel to them. When I first started using Beautycounter, there were 3 products that improved my adult acne better than ANYTHING else I’ve ever tried. Seriously. I use this mask 1x a week for a spa grade facial and 2-3x a week as a spot treatment. If you are suffering from hormonal acne, those are the 3 I would definitely start with. I mix this with a few drops of the balancing oil and use morning and night to help with smoothing fine lines and wrinkles, and even out skin tone. I finally bought some makeup!!! Real talk, I am absolutely obsessed with this foundation. It is basically a tinted moisturizer with enough coverage to even out skin tone without feeling heavy or clogging pores. IT IS MY ABSOLUTE FAVORITE FOUNDATION I'VE EVER USED. Don't believe me? Check out this article called “The products you should actually be buying from your annoying Facebook friends”. Hah. Told ya. Now, you totally can do this by hand (just massage and contour your face in an upward motion) to get your lymph moving. I prefer to use a jade roller tool because it feels nice and cold on my skin. The purpose of the jade roller (and any facial massage) is to promote lymphatic drainage - so, if you've ever experienced puffiness or under-eye circles in the morning, it's due to FLUID build up under the skin that needs to be drained. But don't worry, with some facial massage and daily lymphatic drainage you should notice an almost immediate improvement! Click and of the links in this post or go here: BeautyCounter.com - and each month i'm usually doing a special promo for anyone who spends over $100, so make sure to watch my daily instagram stories (or e-mail me) to stay in the know!